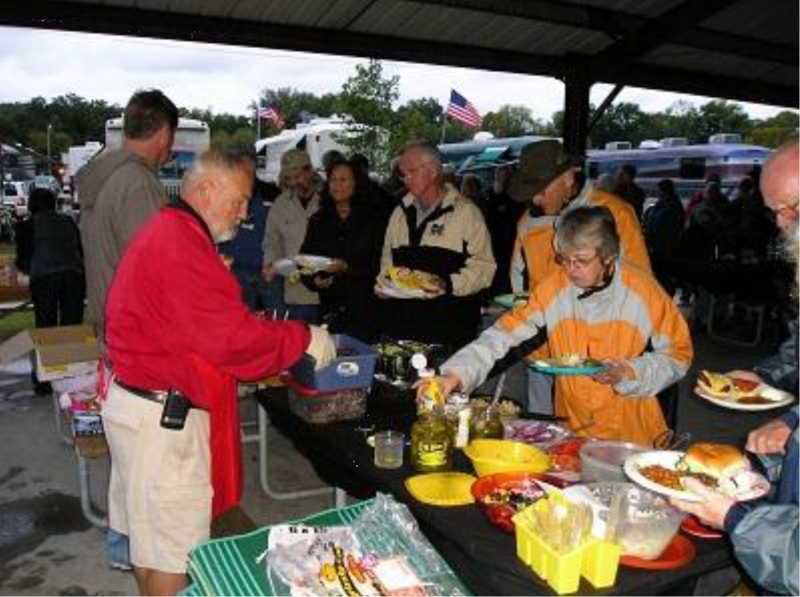 Wednesday October 3, 2012 was a big day for Byron and Betty Pigg the hosts of the Eagles International Branson 7 Day Rally. After months of preparing the big day had arrived. 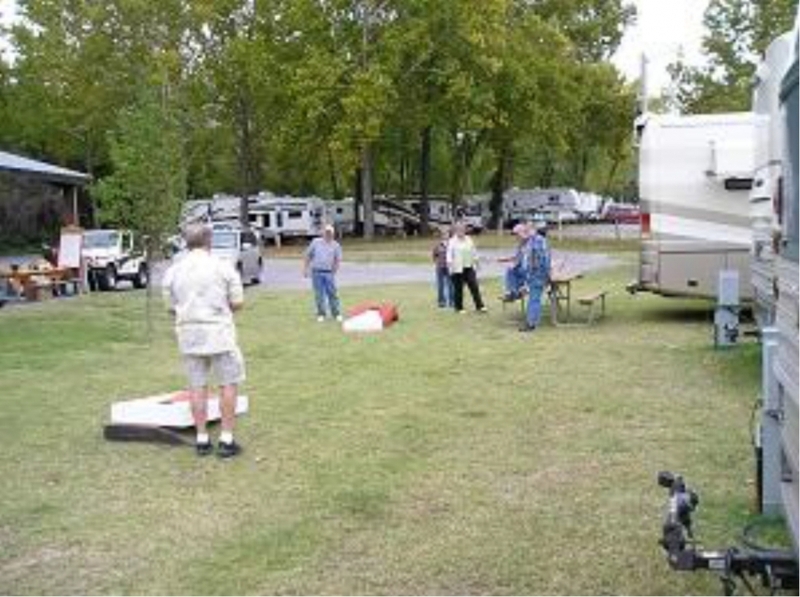 Bryon had all of the reserved spaces assigned at the Branson Lakeside RV Park. 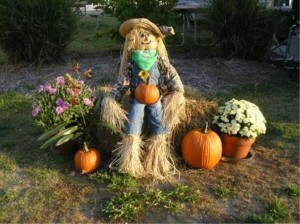 Betty had worked her magic with the fall display to make people feel more welcome. One by one the big beautiful Eagle Conversions started to roll in and it was not long until everyone had finished their ritual of connecting water, power, TV and sewer. Then they could get down to the serious business of catching up on all the gossip since the last rally. This usually included what had happened with their bus, dogs and grandchildren. I am John Swartley, Byron’s brother-in-law. My hobby is writing articles with lots of photos. Every time he has the rally in Branson I try to figure out some way to get invited because I enjoy the big busses and hearing about what it takes to make them go. Each conversion is unique and no two busses are alike. Most of the conversions started as a rusty frame from an Eagle bus that had hauled passengers many a mile. These owners not only saved the bus from the scrape pile they completed their dream with many labor of love hours invested. After talking to the bus owners I found them as unique as their busses. As I drove up I noticed Wayne Schell and Mike Brooks in deep discussion at the back of Wayne’s engine. To my surprise instead of major engine theories the conversation was about Mike’s crop sprayer/seeder plane he had spent several months building down in Arkansas. Mike was explaining how with his GPS how accurately he could fly. Mike’s wife, Sharla is his ground support delivering whatever it takes. Each bus is like a house, it has heating, air conditioning, complete bath rooms, cooking facilities and all the other comforts of home. While connecting all the facilities, Richard Fosse told me about he and his wife Sherri’s experiences giving classes at some of the National Parks. They spend a lot of time living in their bus during this time. 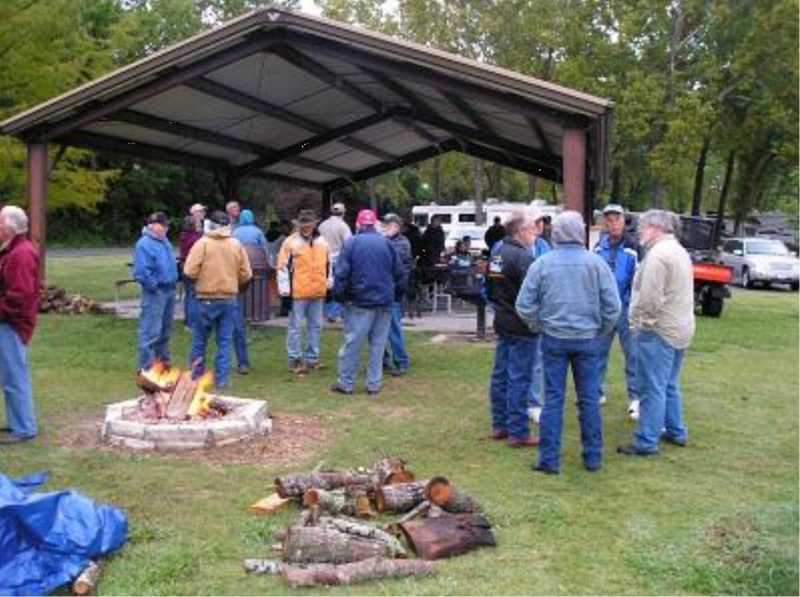 After everyone checked in and connected all their facilities, they joined their fellow Eagle members for happy hour. At five Byron opened the welcome meeting that started with two of the local Branson representatives thanking the group for being there. 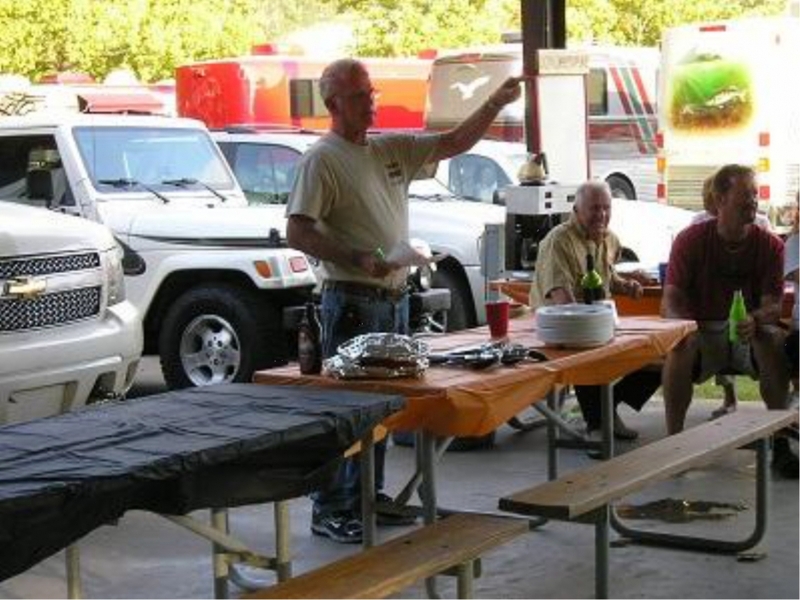 The welcome meeting was cut short by the smell of barbeque catered by Skinner’s. The weather was perfect for the start of the Rally. Every morning Richard Struck hopped out of bed early enough to have the coffee ready at the pavilion and Jeff Jefferson furnished the donuts to start the day off right. Friday was a rainy day, good for scheduled tours. Betty and all the ladies headed to Ozark to enjoy a well known tea room and antique store. After a tasty early lunch including the tea rooms famous pie, they spent the day shopping and enjoyed being out and around. 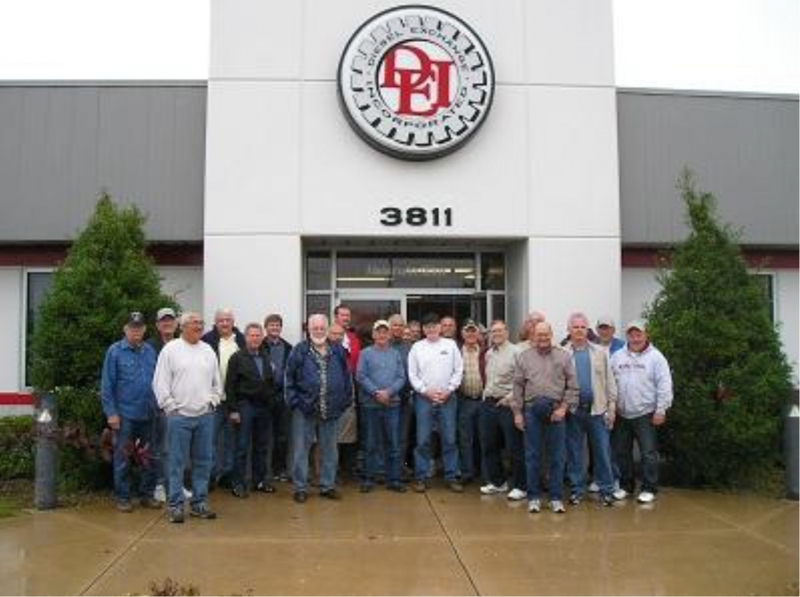 Byron and all the men headed for the Diesel Exchange Inc. complex located in Springfield. They were greeted by the owners, Steve and Lisa Hendrick. 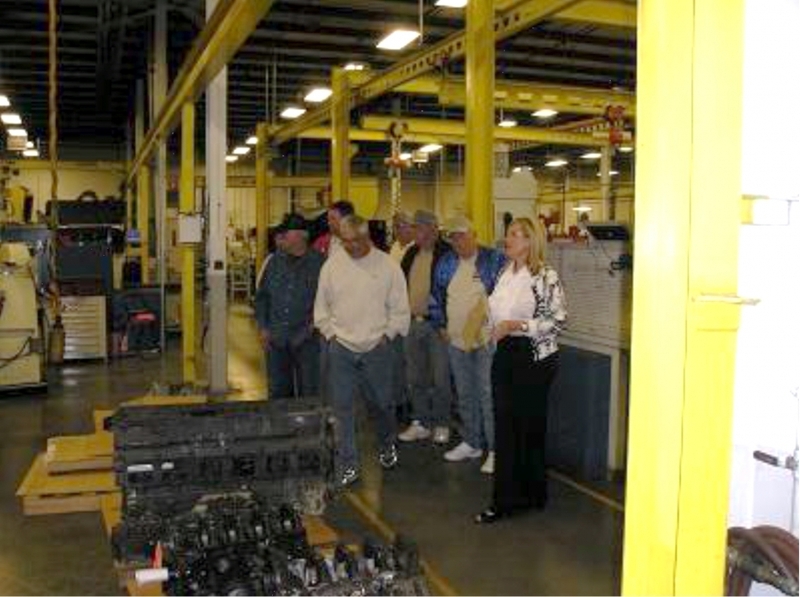 They divided into three groups to tour this large building that rebuilds diesel engines from pickup size to huge stationary engines. 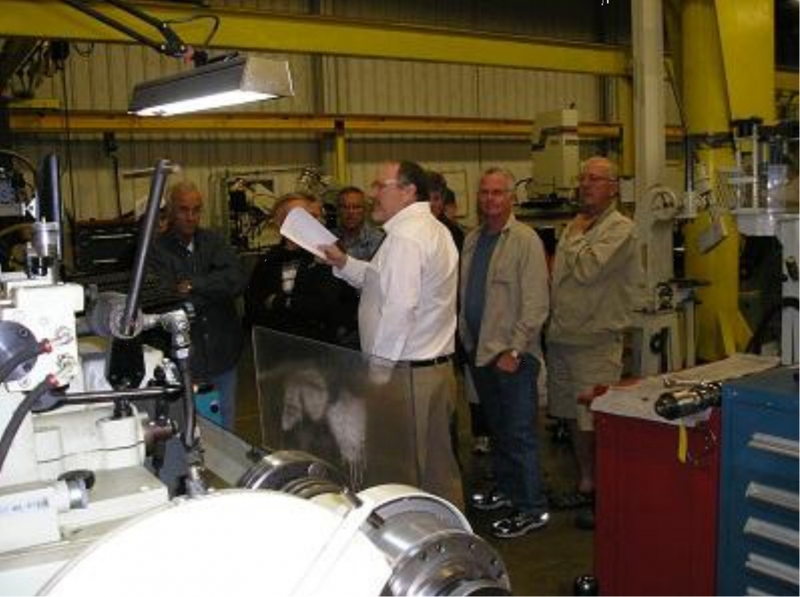 The tour was very interesting as they explained every phase of the refurbishing process. One thing I noticed was all the machinists were adjusting their computer screens instead of calipers and how clean the building was. 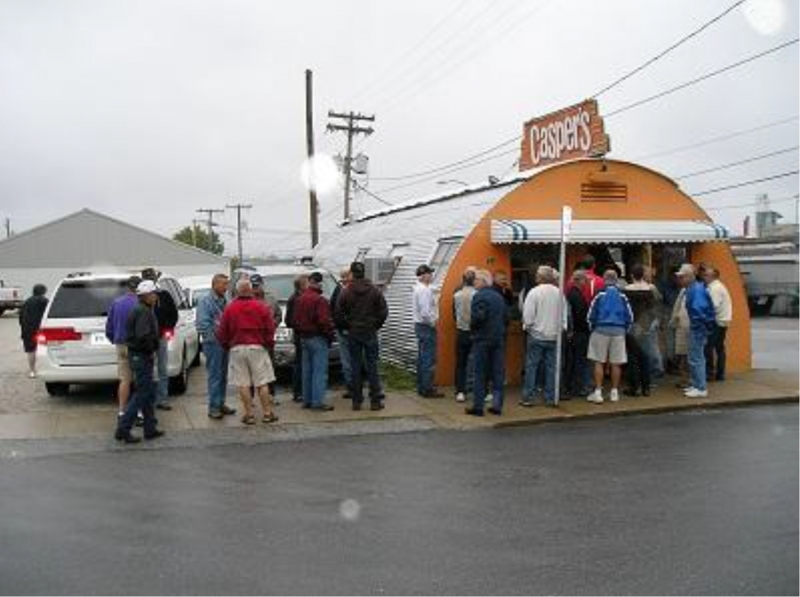 For lunch we traveled to Byron’s favorite eating place, the unique Caspers, to enjoy their famous chili. 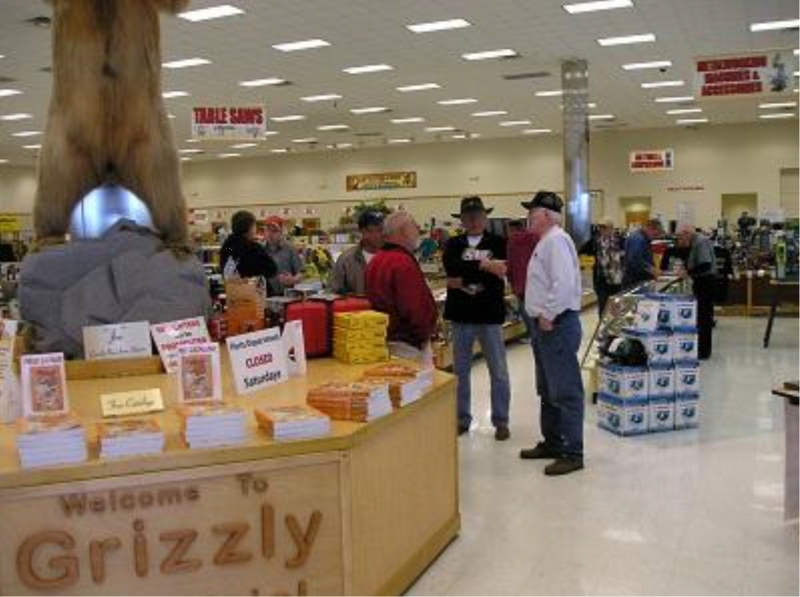 Then on to a must for every male, Grizzly’s tool store. The day’s tours were topped off by visiting Byron’s shop/bus museum before heading back to Branson. 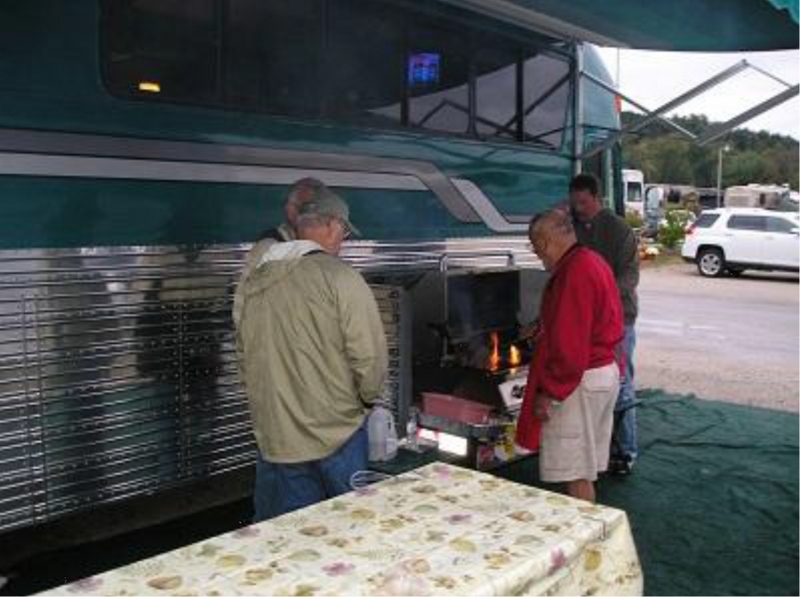 After a long day in Springfield everyone returned to Branson to enjoy hamburgers donated by John and Judy Killingsworth, cooked by master chefs, Dave St John and Eric Brown. There were several side dishes prepared by the busy wives. Preparing for this rally the co-hosts, Byron and Betty, accumulate, donate and buy items for the drawing. All the names are entered and drawn out of a hat. Over 25 items were accumulated for the drawing with the grand prize being a set of power tools donated by Grizzly Tools. 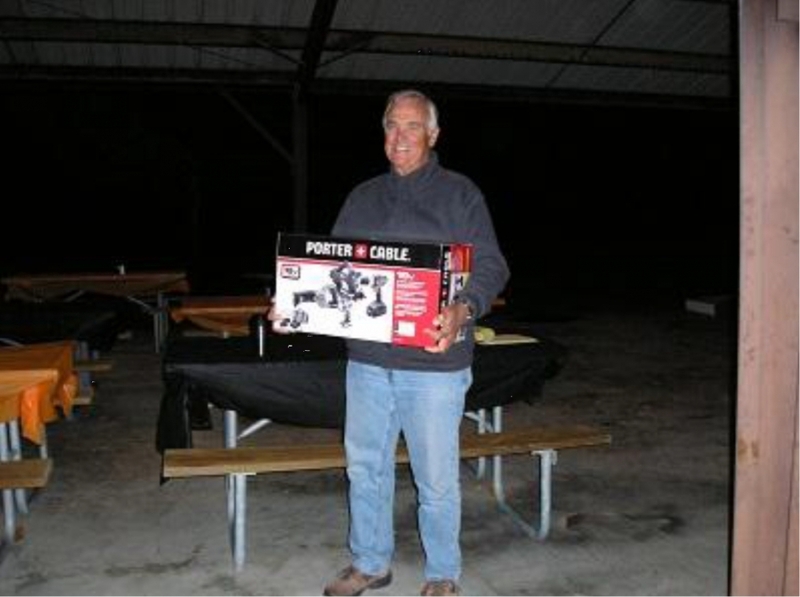 Lee Thomas was the lucky winner of the power tools. 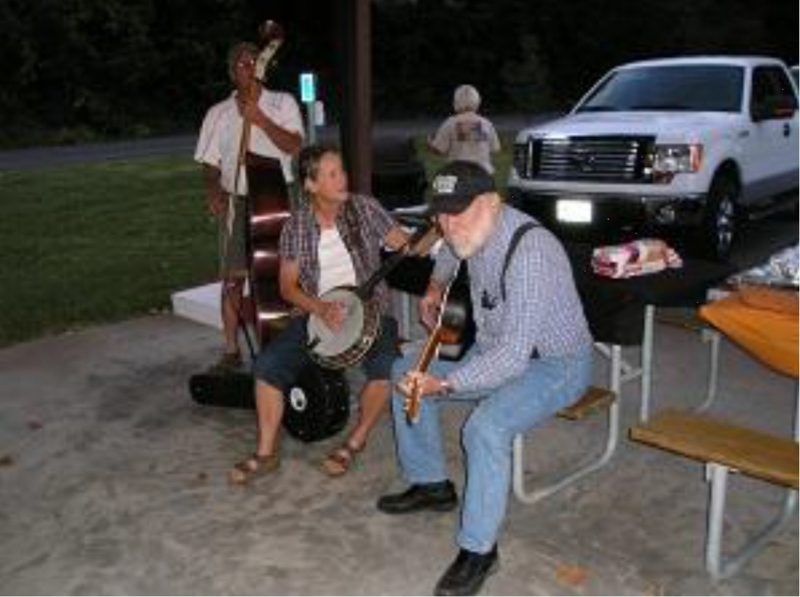 The evening was completed with music provided by Mike and Susan Groves along with Wayne St Onge. No Branson Rally would be complete without a visit from Wayne St Onge. He is a major supplier of Eagle busses that need converting for this area. He also plays a mean guitar. Instead of bringing a bus he motored here in his 1949 “Caddie.” I noticed an Eagle bus with a slide out and I was interested in seeing the inside. The conversion belonged to Red and Linda Rudy. Traveling with them was Linda’s Brother-in-law Tom Clark. They had a couple of interesting stories. Tom was traveling with them because his wife, Barbara, passed away last year while they were all attending the Eagle Rally in Nashville. 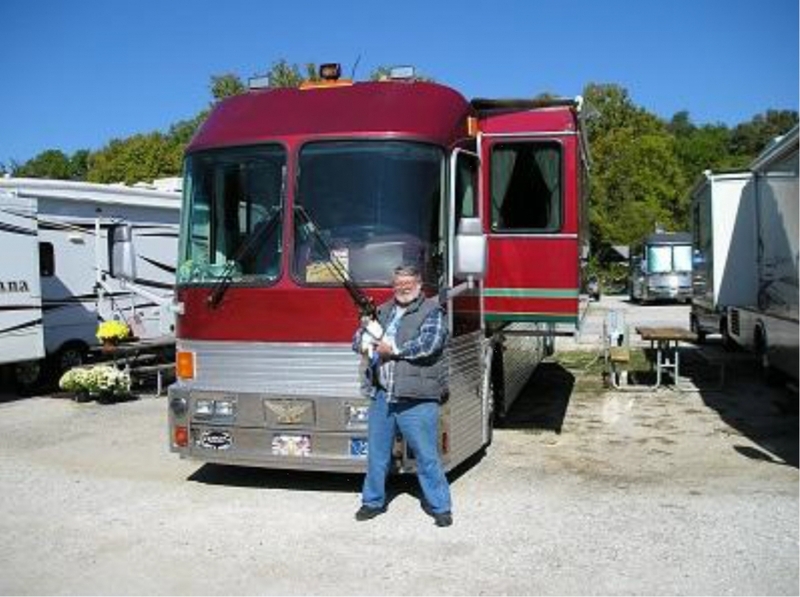 After purchasing this bus, Red, tried to sell his other Eagle in all the bus trade magazines without any luck. He took a chance and listed it on Craig’s List. 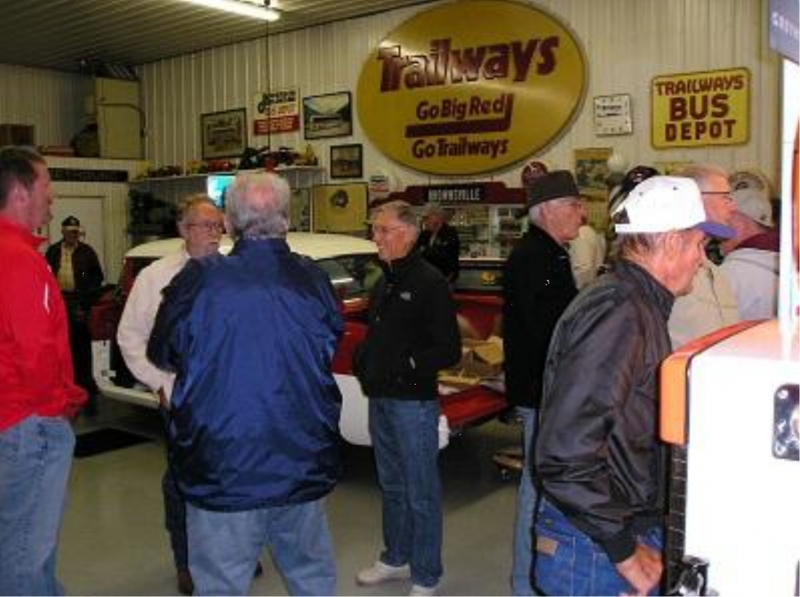 Dan Quenon had seen Red’s bus in the area and recognized it on Craig’s List since he did not live far away. 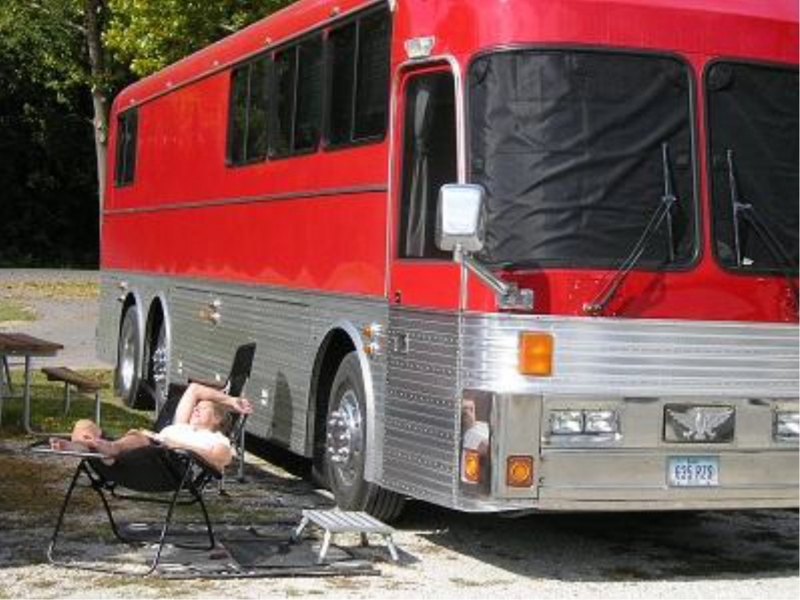 Dan told me that Red commented if he bought the bus they could all go to Branson together. This convinced him there must not be anything wrong with it or Red would not have invited him to come along. 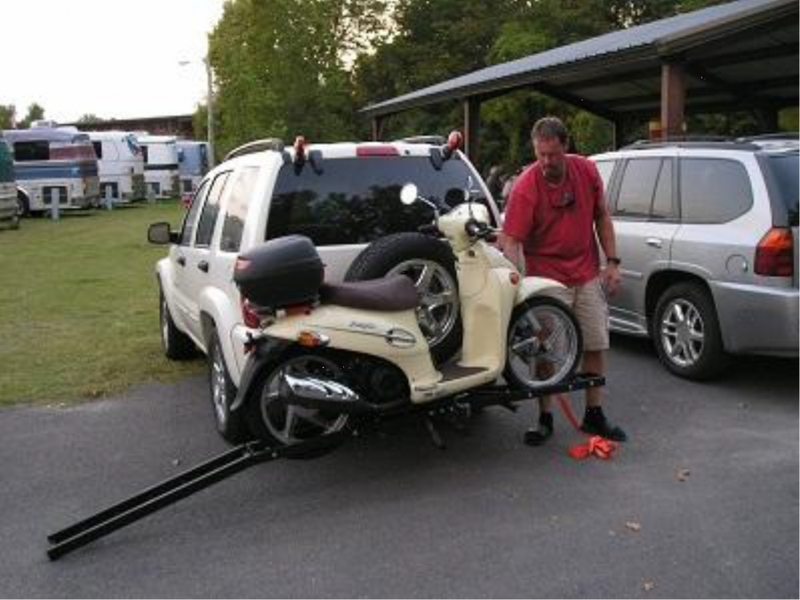 Dan and his Wife Kathy pulled a trailer carrying their motorcycle instead of a tow car. 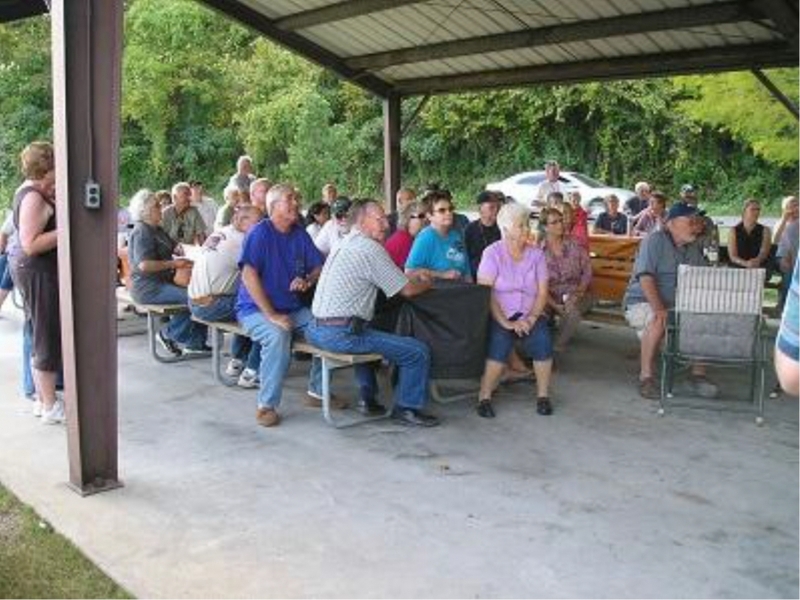 The Activity Schedule had several seminars and Round Tables scheduled for the week. Most of them usually ended up discussing buses and bus problems or other rallies. I am sure there were several major problems solved at this round table. 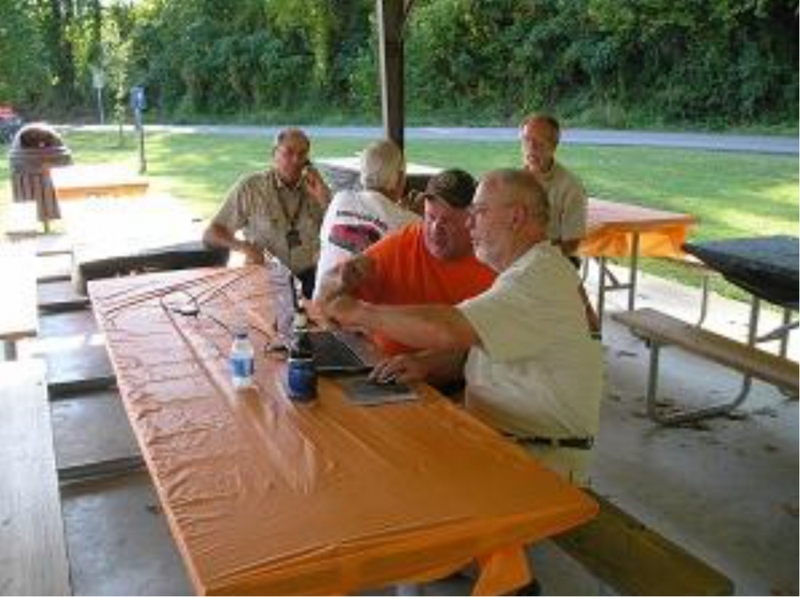 Wayne Schell was showing Dave Kellas and Ron Walker photos of his new Eagle bus that is in the building process. It is still a frame with a lot of new ideas. 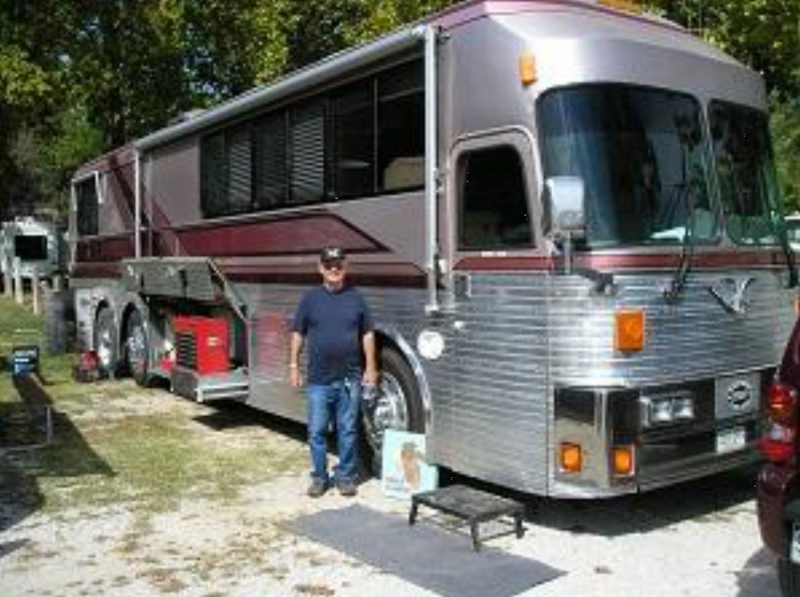 Dave and Lois St John are having an Eagle converted in Kansas and will have two slide outs and one slide in. The slide in is a new design and Dave told me we will have to wait until it is finished to see how it works. 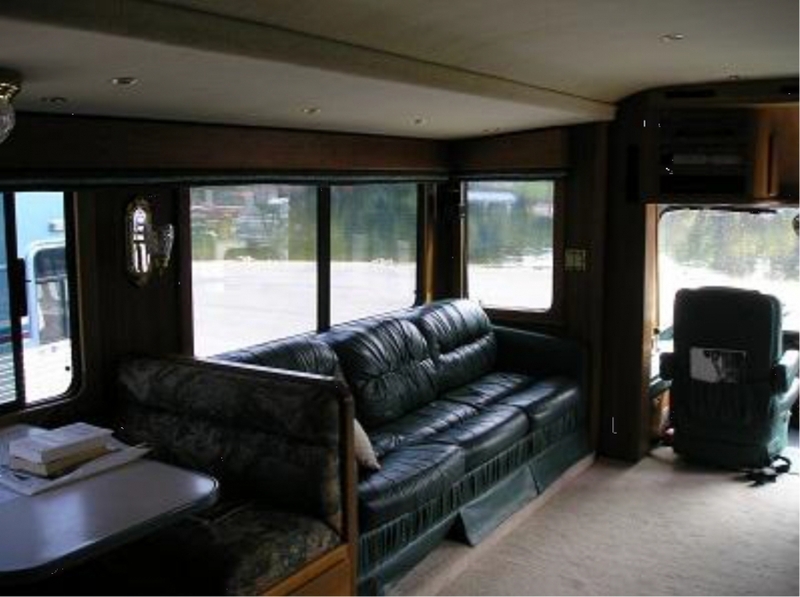 Gary and Gloria Throneberry are in the process of converting a GMC transit bus that will include a slide out. Although it takes years to convert a bus it is always a labor of love. Dave and his dog Rowdy travel in a professionally converted Eagle that was built for the NFL football star, Reggie White. It has a slide out since Reggie was a very big man and needed the space. It seems like Reggie did not drive the bus himself but his girl friend did. According to Dave somehow she got the bus hung up on a railroad track and created quite a problem removing it. Reggie sold it immediately and this allowed Dave to buy it at a very reasonable price. 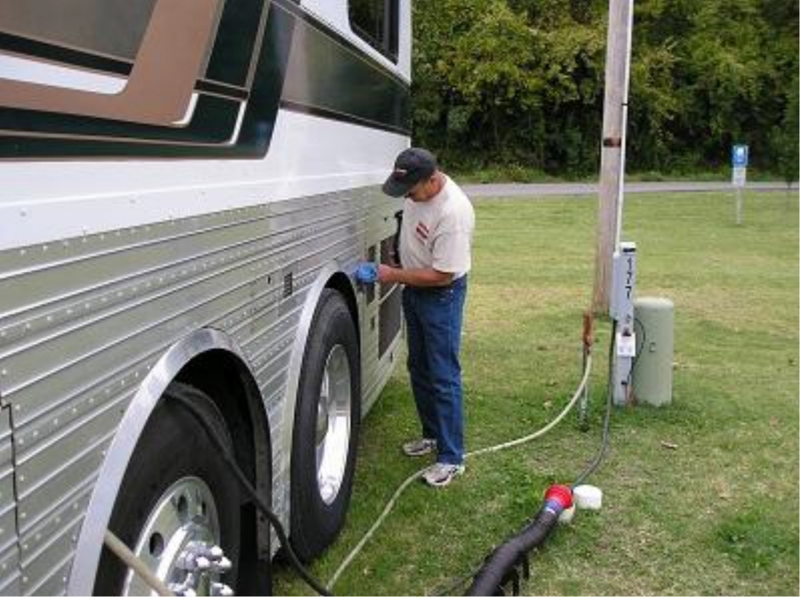 One thing in common with most bus owners is they are proud of their conversions and are willing to brag on their accomplishments. 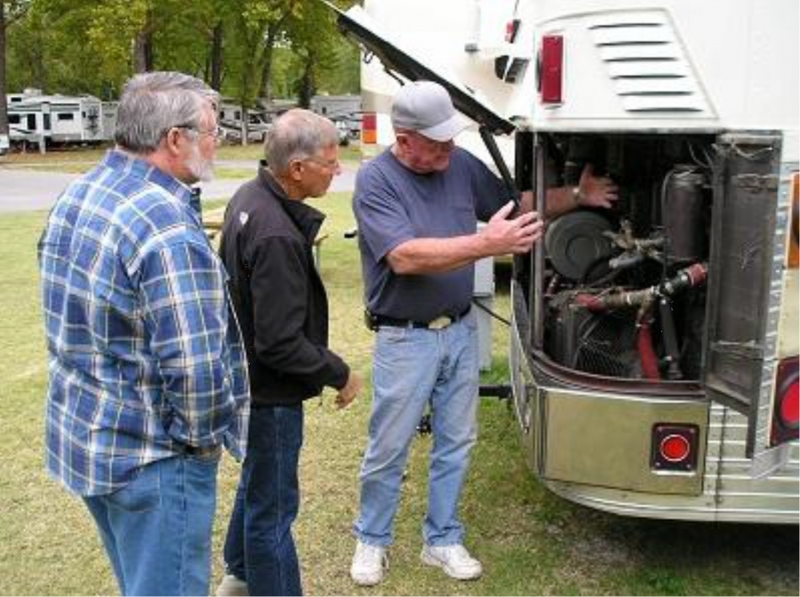 Here Bill Pratt is explaining how his generator cooling system is connected into the bus system. 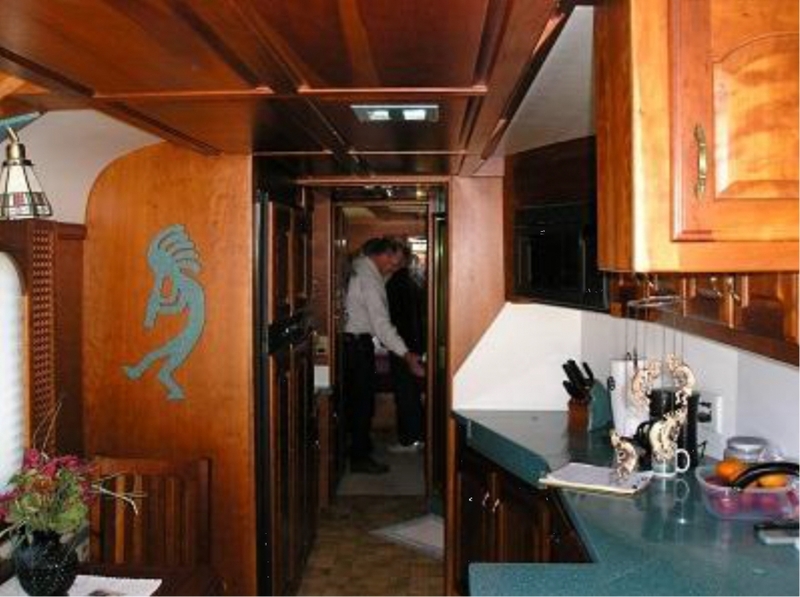 Wayne and Lin decorated their bus with turquoise including an Indian symbol Kokopelli which their son informed them was a fertility god. 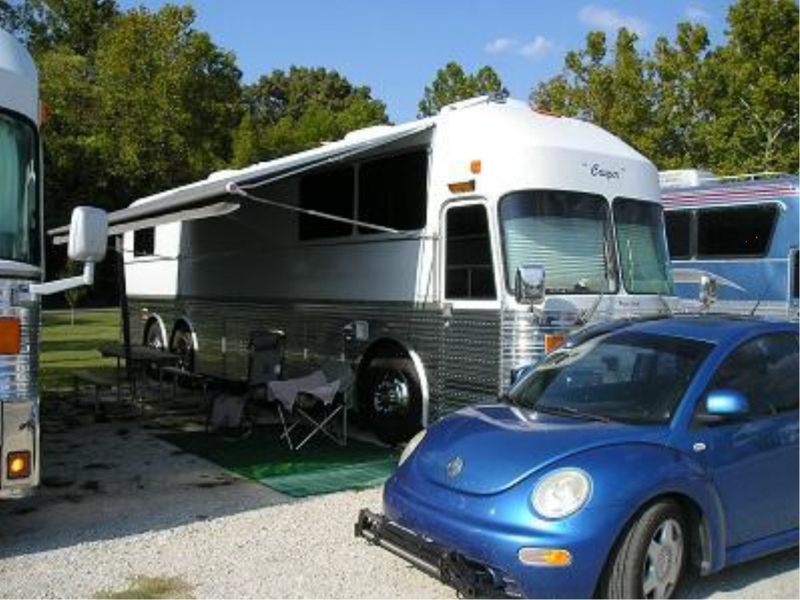 Eric and Karen Brown originally bought their bus for parts and ended up rebuilding it. When a tow car is not enough Eric brought his scooter. He found the rack at a very good price and wanted to use it. John Killingsworth had listened to all of the tall tales of Byron’s bus activities each morning during their daily breakfast meeting. So he and his wife Judy traveled to Wayne St Onge’s and found a bus that filled the bill. 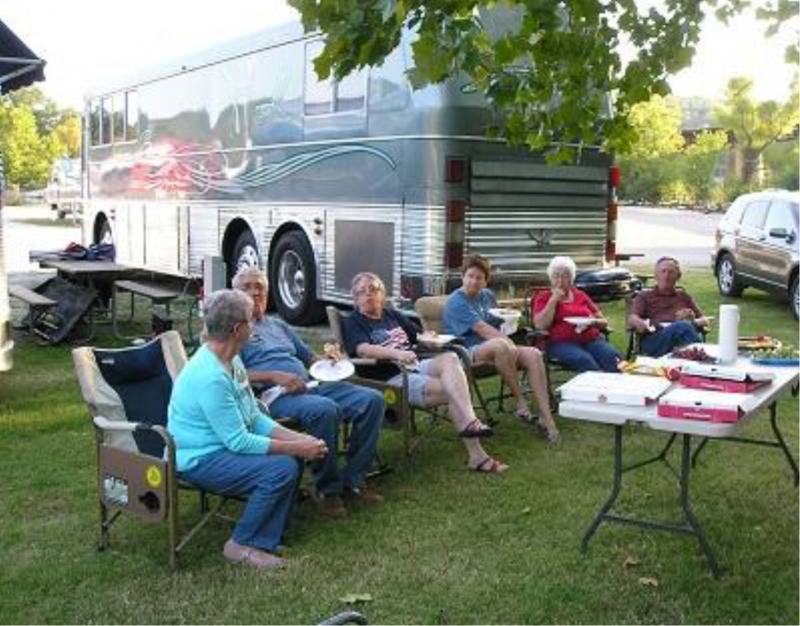 It was not a new experience for Judy since her Dad and Mom, Don and Carol Walker have been traveling in motor homes for years. The Walkers along with Judy’s sister, Charlotte, attended the rally and all of them where enjoying pizzas on this beautiful evening. Jeff and Shirley Jefferson brought their Grandson Jake along to this year’s rally. 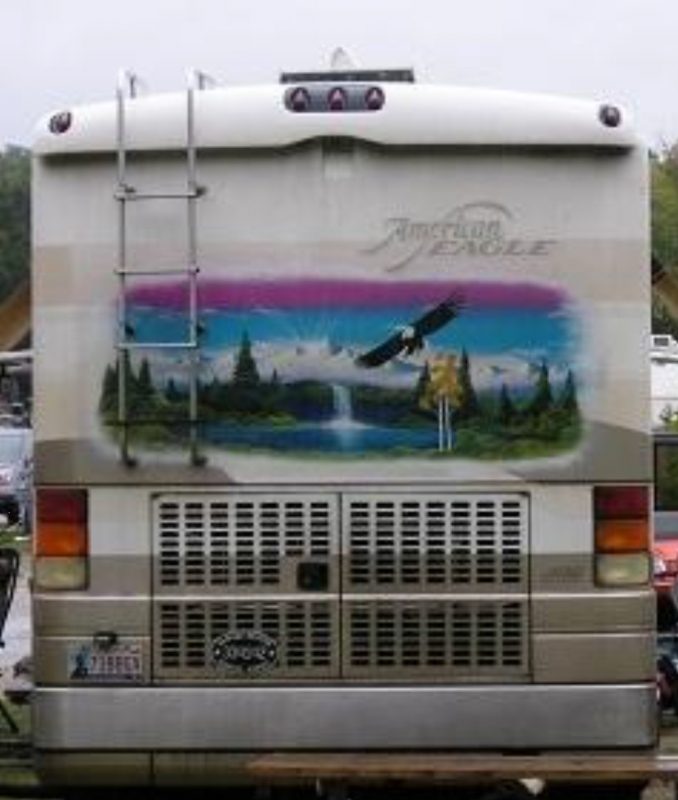 Jeff did not bring an Eagle Bus, but since his motor home had an Eagle mural on the back is was ok to park among the rest of the Eagles. 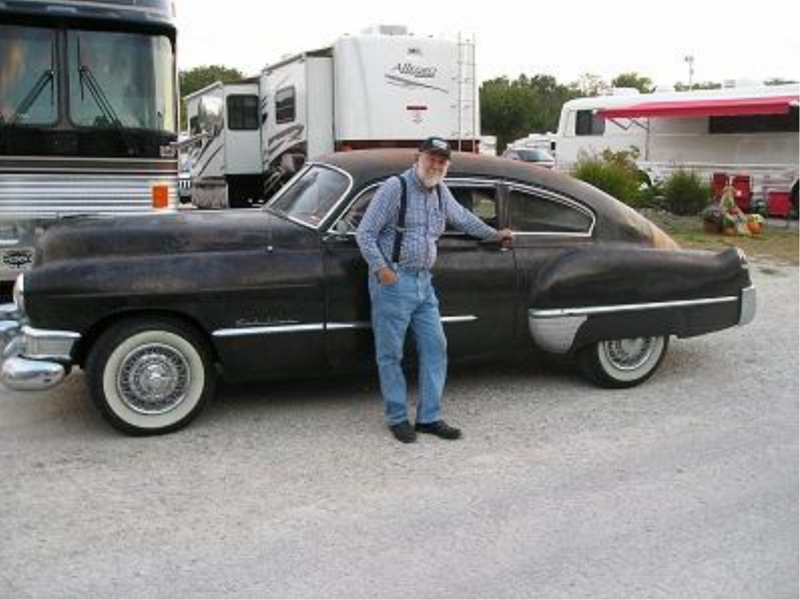 Jeff is a big part of the Eagle industry with his shop and original parts keeping many Eagles on the road. 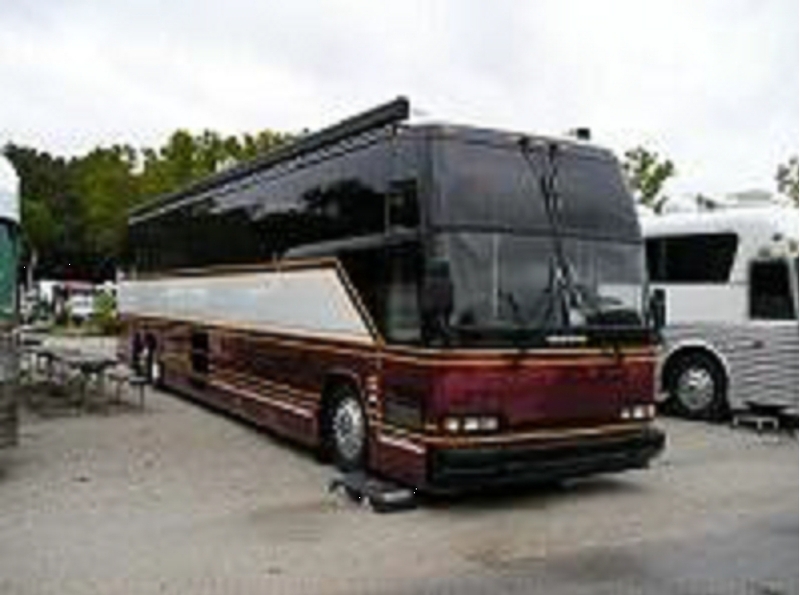 Almost every Eagle owner has had their bus worked on at Jefferson’s one time or the other. Arthur and Aura Griffith’s bus is still a work in progress and he has been working on his labor of love for almost nine years. He has done all the work himself and he is a perfectionist. One thing I noticed was his siding was glued on; very few rivets. 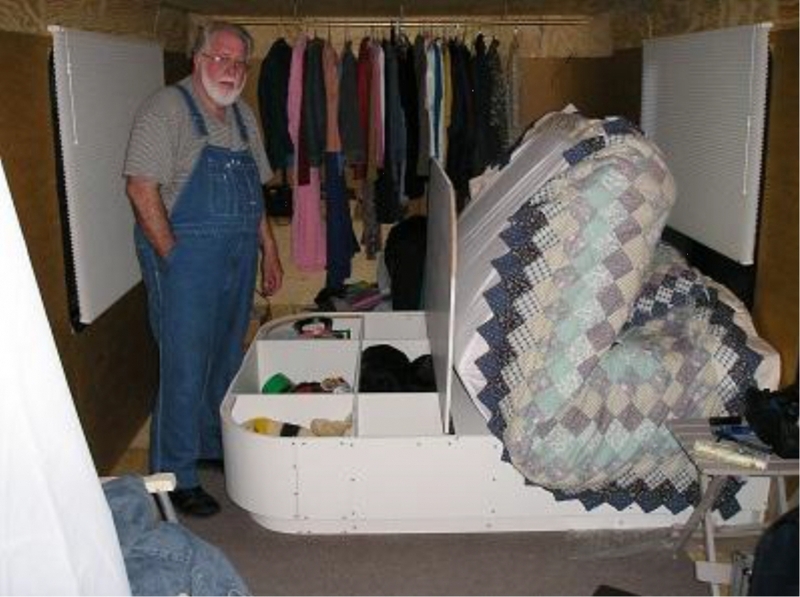 Arthur designed a folding bed to allow storage on both ends. It will be a while before they are finished but for now they can travel very comfortably. One thing about traveling in a bus, if you get bored there is always something that needs to be done. Buck Boulding told me they could not pay him enough to clean the bugs off of his shield but he was enjoying himself on this beautiful day. His other bus is an Eagle. I asked his wife Pat why she did not drive the other one out here kinda like his and hers busses. Pat explained she has trouble reaching the petals. The newest Eagle Bus International members are the Cassinger Family Richard, Molli, Alayna, Zac and Zain from Ink Missouri. Their Eagle bus, named Dream Chaser, is now just a shell. It will be interesting to watch their bus and family grow together. 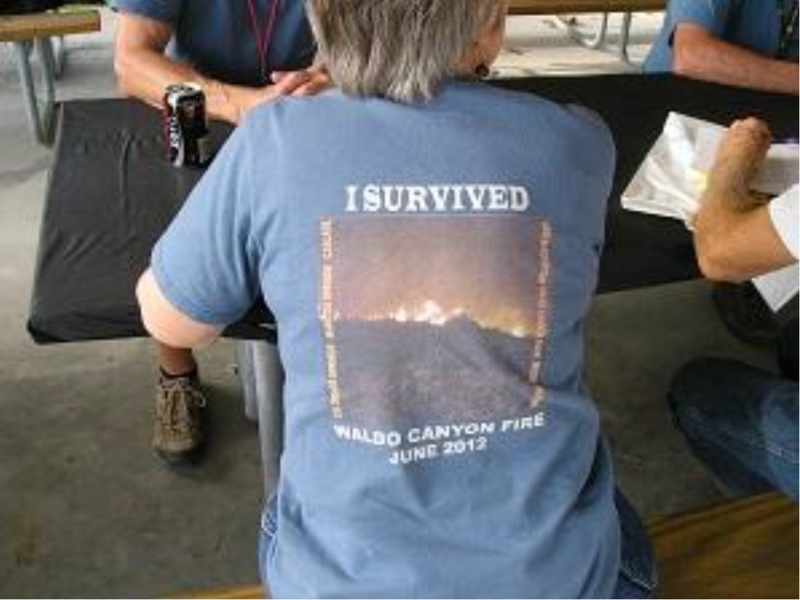 I spent the summer close to Colorado Springs and watched in horror as the Waldo Canyon went up in flames. When I saw the tee shirt that was very popular in Colorado I started asking questions. Leroy and Anne were enjoying their Eagle bus near the burn area. They just moved on to Lake George. 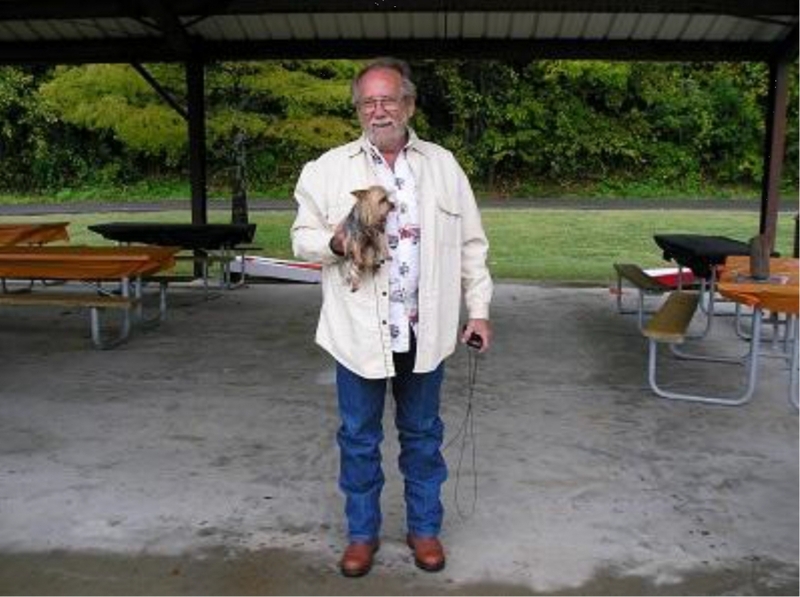 After Sonnie Gray’s wife,Patty , passed away a few years ago this five and half pound dog aka, Lilbit has been keeping him company as he travels. Sonnie is the current President of the Eagle International Club. 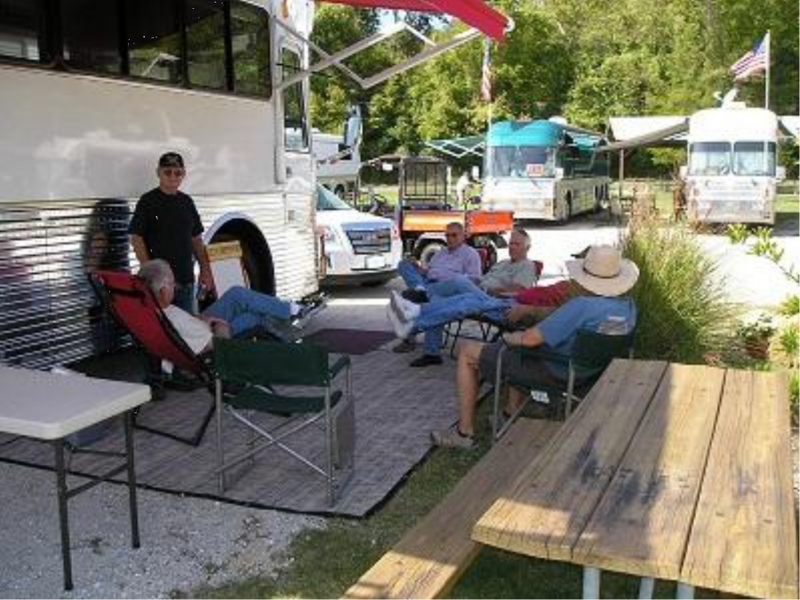 One big advantage of traveling in the bus is the ability to take your traveling companions with you. The St John’s have Kipu and Cunu; Bill and Lani Pratt Have Dallas and Sophie. This is the Eagle Don and Carole Gouley travel in. You will notice Don has the most important component of a bus; the big red tool box. 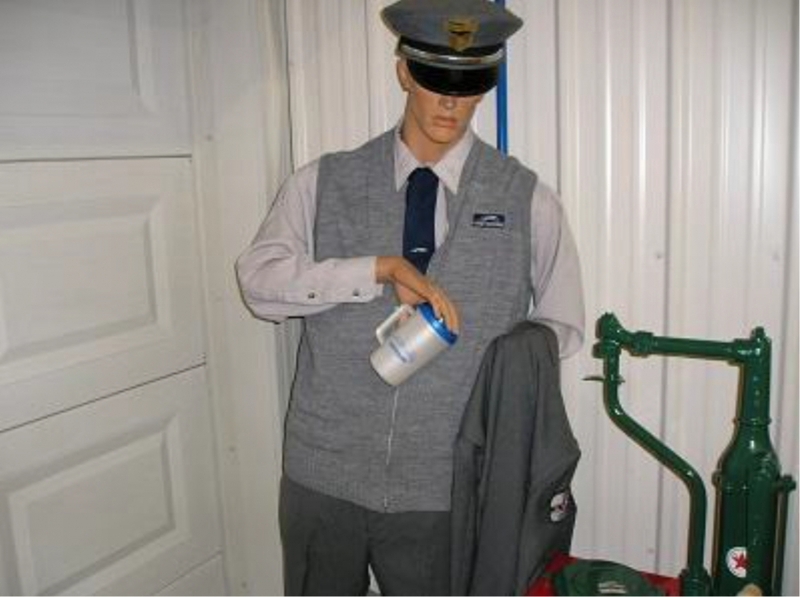 Since Richard Struck had to rise early to make coffee every morning he had plenty of time to polish his bus. 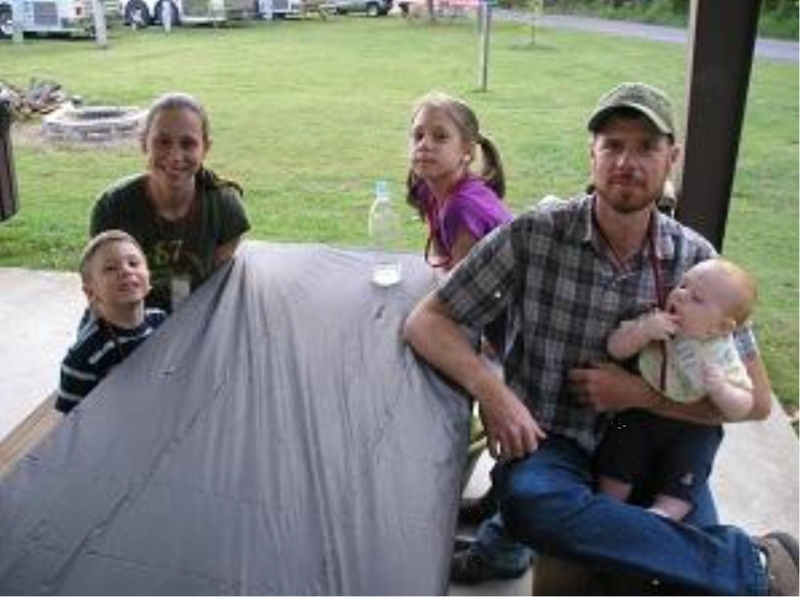 He and his wife, Kathy, live in Fort Lupton, Colorado when they are not traveling. 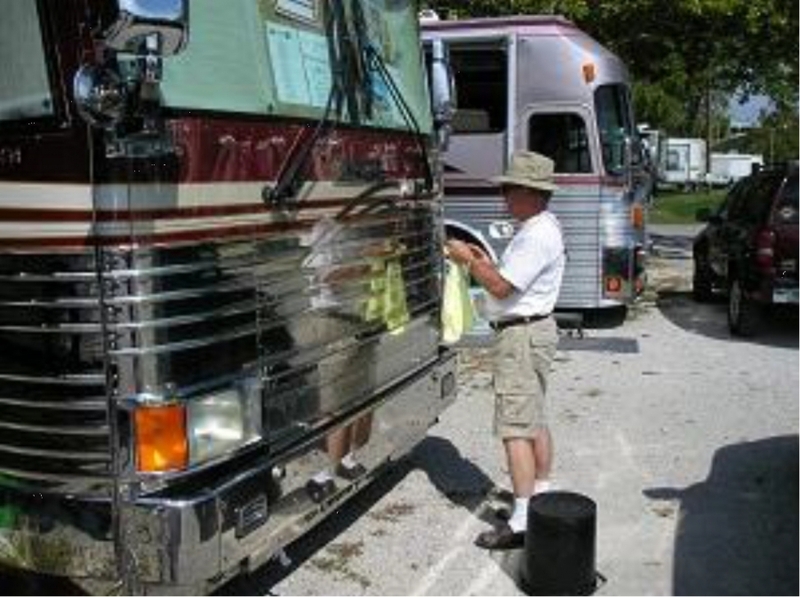 Ron Walker had quite a surprise; one of the members had shown Ron’s bus on U-Tube and the tour owners that had owned his Prevost recognized the paint job. He called Ron and told him all about the bus in its former life. Life cannot get any better for Sharla Brooks than soaking up the Sun Shine. 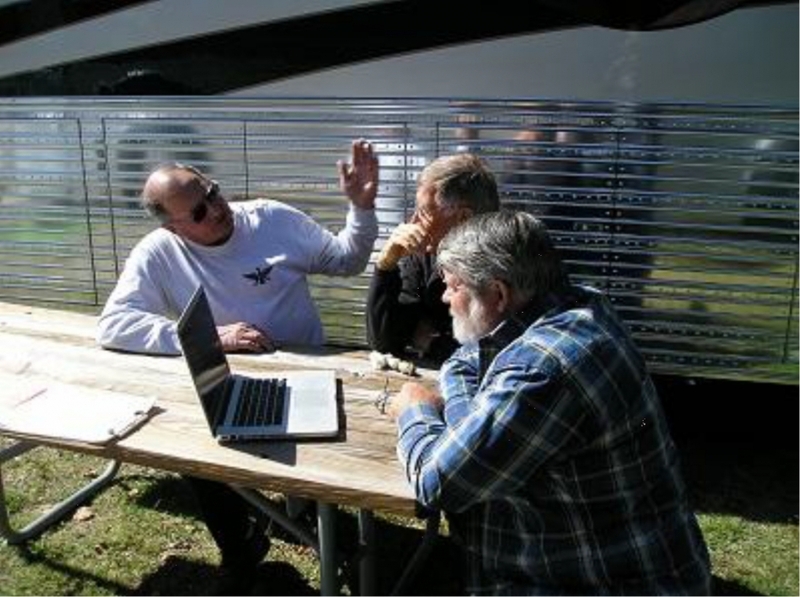 Jeff Moore and Dave St John are doing some serious research. Some day Jeff will have his Eagle, right now he has higher priorities, his daughters. The last evening of the rally was spent playing a little bean toss and conversation. Jim and Denise Hufford did not have to travel very far to attend the rally from Pine Bluff Arkansas. Denise told me they like to travel to the beautiful Smokey Mountains and bicycle on the miles of trails. They also motor to famous Hot Springs Arkansas just a few miles from home just to soak in the springs.